Inhabitants of the Xingu Indigenous Park, the Wauja are famous for the exceptional quality of their pottery, the graphic designs of their baskets, their feather artwork and their ritual masks. In addition to the richness of their material culture, this people possess a complex and fascinating mytho-cosmology, in which the links between animals, things, humans and extra-human beings permeate their conception of the world and form crucial aspects of their shamanic practices. Speakers of a Maipure language of the Aruak family, the Wauja comprise, along with the Mehinako, Yawalapiti, Pareci and Enawene Nawe, the group of central Maipure (Payne 2001 apud Franchetto 2001: 116). The Wauja inhabit the area surrounding Piyulaga Lake, a name which may be translated as ‘place’ or ‘fishing camp,’ and which also supplies the name of the village. The lake is linked by a channel to the right shore of the lower Batovi river, in the western region of the basin formed by the affluents of the upper Xingu river, in the state of Mato Grosso. Foto: Harold Schultz, década de 1950. The first historical notice concerning the Wauja was recorded by the German ethnologist Karl von den Steinen in the diary of his first expedition to Central Brazil, on the 24th of August 1884, after passing the fourth and last Bakairi village on the Batovi river: “we asked excitedly about the existence of other tribes. We were told clearly that the Custenaú and Trumai were found on the lower river. We were unable to understand what they meant by ‘vaurá.’ Could this be a tribe?” (Steinen 1942: 211). A week later he obtained confirmation among the Suyá – who drew a hydrographic map for him, in which were found represented the majority of the tribes of the Upper Xingu (Steinen 1942: 255) – that ‘vaurá’ was a large group inhabiting the lower Batovi. However, the history of this Aruak-speaking people in the region of the Upper Xingu river basin began at least a thousand years before the arrival of Karl von den Steinen. Archaeological investigations in the Upper Xingu, initiated by Dole (1961/1962), advanced significantly during the 1990s with the work of Heckenberger (1996), which enabled a precise and extensive depiction of the sociocultural changes and continuities in this enormous and archaeologically little explored area on the southern periphery of Amazonia. The Aruak-speaking peoples – Wauja and Mehinako – who live in this region today are the direct descendants of various groups who migrated from the extreme south-west of the Amazonian basin and established the first Xinguano villages between 800 and 900 a.d.. The nature of the archaeological remains and radiocarbon datings during the interval between the years 1000 and 1600 indicate an occupation typified by a predominantly sedentary pattern of settlement based on large and populous circular villages (of 40 to 50 acres) with a central plaza, by wide-ranging transformations of the landscape, by the construction of public works intended to defend the villages – ditches, palisades and raised walkways – and by a ceramic technology particular to this region from after the referred date (Heckenberger 2001). Pottery is one of the technological and artistic domains of greatest interpretative potential in terms of Pre-Cabralian history. 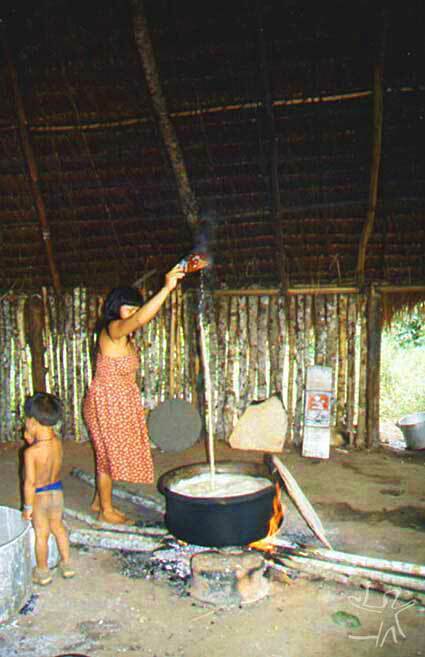 In the Upper Xingu, domestic equipment has remained practically the same for the last 1000 years, providing evidence of an impressive cultural continuity. 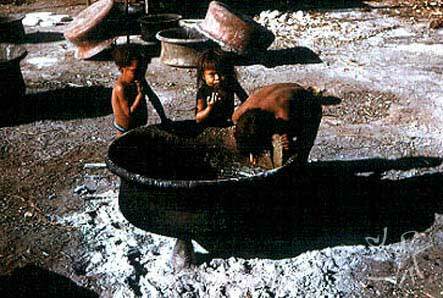 Platters for toasting manioc bread, conical supports and large pans with extroverted rounded or flattened borders continue to be intensely fabricated and used by the Wauja. The evidence found at the Aruak sites in the Upper Xingu basin indicates that these are much more than isolated cases: they are linked very closely to a series of other sites with similar characteristics distributed across an extensive ‘corridor’ on the southern periphery of Amazonia – more precisely, from Mojos (Bolivia) to the Upper Xingu, passing through the Upper Madeira and the Upper Acre, pointing to a co-evolution of Aruak cultural systems around the 1000 a.d. (Heckenberger 1996). The central and globalizing feature of these Aruak systems is the “regional sociopolitical integration based on common culture and ideology and developed patterns of exchange (intertribal trade, marriage, visits and ceremonies)” (Heckenberger 2001: 31); I would also include the dimension of war alliances. According to the evidence from the various sites that have already been excavated, as well as Carib oral history, it is known that the model of the sociocultural multiethnic system known today was already consolidated by the mid 18th century. I should stress that in this area a gap in investigations still remains to be filled, namely the ethnohistory of the relations between the Aruak and Carib peoples in the Upper Xingu, the groups who gave rise to this multiethnic system. Heckenberger (1996) undertook his research among the Kuikuro, a Carib group, and his interpretations therefore derive from the points of view that the Kuikuro imprint on Xinguano history. Now it remains for us to follow the leads given by the three last Aruak groups who still preserve their oral history, the Wauja, the Mehinaku and the Yawalapiti. Among the former, the only individuals capable of transmitting with any certainty stories of the past are in their last decade of life. Our understanding of Xinguano history will be further enriched by including these other points of view. The study of rituals seems to be one of the best ways of achieving this, as demonstrated in the study by Menezes Bastos (1990) of the Yawari ritual among the Kamayurá. Ritual music, for example, performs an extremely delicate ‘language of historicization’ of the relations between the Xinguano peoples. For the Wauja especially, music is always history, whether it is about a recent past, involving simple facts of life, about encounters with other tribes, or about the time in which animals were people and used to speak. The extensive study of rituals will allow confirmation and extrapolation of the strong hypotheses indicating that the Xinguano social system rests on an Aruakan ideological base, since the elements actualizing the ‘etiquette of Xinguanity’ and the stylization of social relationships at a regional level are contained in these rituals. These elements can be clearly inferred from the ethnographies available on the topic. In a strict sense, there are only two ethnographies that may be considered ‘completely’ about the Xinguano intertribal rituals, one by Agostinho (1974) and the other by Menezes Bastos (1990). There exists a series of small articles and book chapters that partially or only very partially describe a few of the Upper Xingu rituals. Approximately 270 people (from a census by the author made in June 2001) reside in a single circular village (figure 2), with the typical Xinguano system of a central plaza and a house of flutes. 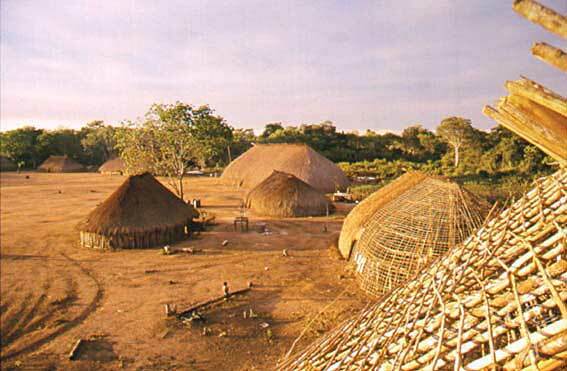 Another 63 people live in other localities within the Xingu Indigenous Park (XIP). The residential units in Piyulaga are slowly breaking with the pattern – frequently cited in the Xinguano literature – involving the cohabitation of the various kin of an extended family and their affines. Of the 17 residences existing in October 2000, 12 were inhabited by one or two couples and their children, while only 5 residences were inhabited by extended families of kin and affines. The rules of uxorilocality (a rule by which the couple lives in the woman’s house after marriage) and virilocality (the couple lives in the man’s house after marriage) exist concomitantly, seemingly without one prevailing other the other. I conjecture that the increase in houses and the reduced number of residents per house may be related, among many other factors, to the population reduction deriving from the epidemics of the 19th and 20th centuries, and the impact of the technology of metal tools in the ‘subsistence economy.’ Using axes and other metallic objects, two men can join together to clear an area for planting and prepare a swidden sufficiently large for sustaining a small domestic unit of ten to twelve people, including children. It is probably the case that the metallic tools used in agricultural production have interfered significantly in the social organization of the family planting of swiddens. However, there is a contrast between daily subsistence – which perhaps may involve a few co-residents in a single domestic production unit – and the village’s collective efforts to obtain surpluses of food provisions during the large inter and intra-tribal festival cycles. In so far as the relations between technology, production and social organization are concerned, no hypothesis can be corroborated until a detailed study of the Wauja economy is made. The Wauja territory covers the south-western part of the Xingu IP and has one of the largest continuous borders with zones of timber exploration and extensive cattle ranching in the north-east of Mato Grosso State. At the end of the 1980s, the Wauja were victims of armed attacks by farmers from the region of the Upper Batovi, who burnt the only three houses of a small village called Ulupuene, which had been constructed for the strategic purpose of defending this area, corresponding to the lower region of the Batovi and Ulupuene rivers, a tract which had not been included in the official demarcation of the Park in the 1960s (Menezes 2001: 240). In 1998, this small border enclave of the Park was approved in the Wauja’s favour as the Batovi Indigenous Territory (Menezes 2001: 241). But according to the chief (amunaw) Atamai, the primary aim of the Wauja territorial struggle is a sacred place where an archaeological site with rock paintings is located, called Kamukuwaká, 40 km to the south of the mouth of the Ulupuene river (Ireland 1991). The 1998 judicial resolution eased the tensions between the Wauja and neighbouring ranchers, but not enough to suppress them completely. According to some informants, fishermen and hunters continue to seek permission from the Indians to exploit natural resources in the south-west of the Park, an area whose surveillance is under Wauja responsibility. The issue of securing lands bordering the Park is vital for the survival of the latter, and its inhabitants are increasingly inclined to fight for new land demarcations. Despite the process of technological change under way since 1884 – when Karl von den Steinen made contact with the Wauja and relations with non-Indians became more systematic – many items of traditional material culture still remain in use, including those that could be easily substituted for plastic, glass or metallic items. But it is for symbolic – much more than functional – reasons, that traditional artefacts continue to perform a role in the reproduction of Wauja culture. Material culture is also responsible for the reproduction of Wauja culture for the exterior, not only on the ‘White man’s’ market, but also within the Indigenous Park as a whole. For example, requests for bead waistbands with designs are made by the Kayapó of Jarina-Capoto, an area to the north of the Park. The artefacts of Wauja material culture are highly appreciated and some of the most successful items on the market of Brazilian indigenous craftwork. 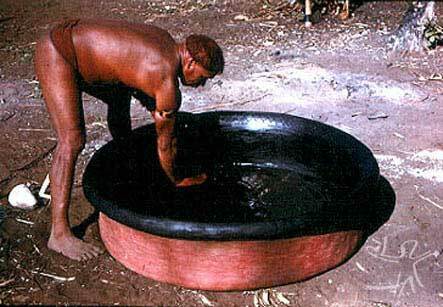 Their very distinctive pottery is an emblem of their ethnicity. Today, pottery has an extraordinary weight in the economic sustenance of the acquisition of industrialized goods. As in any system of decorative art, it is the standardized combinations of basic elements that determines the formation of a motif. Wauja design utilizes approximately 40 to 45 motifs in the decoration of material culture, excluding many others used especially in body painting. Despite this rich variety of graphical motifs, only 16 motifs are employed with any frequency, and, among these, the kulupienê motif (figure 2) has been designed with a very high frequency on all types of substrates since the first historical report on the Xinguanos in 1884. This motif has also been identified on pottery from the 12th century. The Wauja possess three main types of basket: mayapalu, mayaku and tirumakana. The first, with an open weave and without designs, is used to transport cargo and briefly store manioc; the latter two, with a closed weave, display a dazzling variety of graphic designs. All baskets are made exclusively by men. Their uses basically follow the principles of the sexual division of labour: the woven fishing basket is for male use while the domestic basket is for female use. The large-scale mayaku (60x50x20 cm) is fabricated in special contexts as payment for ritual services to the sponsors of mask and flute festivals. The large baskets – objects requiring a high degree of technical skill and experience – have a higher symbolic value than the smaller baskets, which are usually made by young apprentices and more recently have been made to supply the ‘tourist art’ market. For the Wauja, the feathers of birds are their ‘clothing.’ After being killed, the birds are ‘undressed’ (plucked). Their plumes, having become ‘leftovers,’ will go to make up one or more adornments, mixing feathers from different birds, in compliance with the patterns of visual composition. On human beings, the feather adornments conceptually approximate clothing. Featherwork is an essential element in rituals. A man rarely dances without the full set of adornments: ear decorations, diadems and armlets. Even the masks the Wauja use cannot dispense with these adornments. Featherwork and body painting are expressions of beauty that contribute decisively to the production of joy in the rituals. As with other groups of Upper Xingu, the Wauja possess a truly musical view of the universe (Basso 1985 and Menezes Bastos 1990 and 2001). Music is one of the principle domains for the symbolic ordering of the relations between men and women, human beings and extra-human beings (yerupoho, apapaatai, masked monsters and animals). By producing joy and semiotically linking other expressions (dance and body decorations), music subtly moulds a pattern of balanced and productive (non-predatory) co-living. As among many peoples of Amazonia, the notion of joy – which very often includes the notion of music, but at the same time extrapolates it – possesses a deep philosophical resonance that founds native socialities (cf. also among the Araweté, Viveiros de Castro 1986). The Wauja possess an extensive repertoire, both instrumental and vocal. Each ritual has its own series of music, whether funerary, male or female initiation or mask rituals. 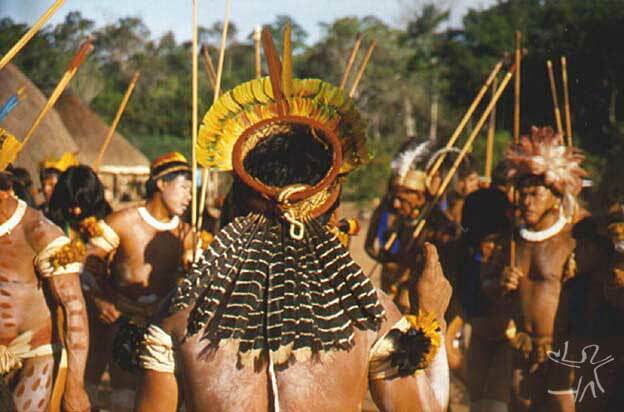 Among the Indians of the Upper Xingu, the myth of the origin of humanity tells that the demiurge Kwamutõ, threatened by a ‘jaguar-man,’ promised him his five daughters in marriage. On arriving back at his village, Kwamutõ asked that his daughters marry the ‘jaguar-man.’ All of them refused. Kwamutõ then had the idea of cutting five tree trunks. He painted them and using tobacco smoke and music played with a rattle, brought them to life. Kwamutõ then ordered that the daughters made from trunks went to meet the ‘jaguar-man.’ Three died on route and two married him. One of them was killed while pregnant by her mother-in-law after a domestic row. Twins were removed from her belly and raised by their aunt, who they called ‘mum.’ After becoming adults, they learnt that their uterine mother had been killed before their birth. Saddened, the two young men (called Sun and Moon) cut a Kwarup trunk to remember and say farewell to their dead mother. Thus, the twins held the first Kwarup, which for centuries now has been a great intertribal funerary festival dedicated to people of chiefly lineage. Aware of the lack of people in the world, the mythic heroes Sun and Moon decided to cut more Kwarup trunks and give life to the first human beings using the same methods employed by their grandfather Kwamutõ. They created the Xinguano Indians, the ‘wild’ Indians (from the Xinguano perspective) and the Whites, who left the region and only returned much later with their firearms. In Wauja life, there is a permanent and ample presence of extra-human beings who come from the time in which animals were people and could speak. One of the principles on which this presence is based is the unbroken link between the apapaatai/yerupoho and animals, who the Wauja deal with daily, above all through their alimentary system and their theories of sickness and dreaming. In primordial times, total darkness reigned over the world. On the surface of the earth lived the yerupoho, anthropomorphic or zooanthropomorphic beings, and the humans (the ancestors of the Wauja) lived inside termite nests, in absolute want of cultural goods: fire, pans, baskets, foods etc. One day the yerupoho heard it announced that the cultural heroes of the Wauja would make the solar body appear once and for all in the sky. Fearful of the imminent cosmic change, the yerupoho threw themselves into the frenetic work of creating raiments, mask and protective painting against the harmful and irreversible transformative actions of the sun. The yerupoho created an extremely diverse set of raiments, which were not simply protective ‘clothes’ (na~i). On placing these on themselves, they assumed the identity of the ‘clothing’ and turned into apapaatai: an ontological reality which is perpetuated today and which corresponds to the various classes of animals seen on a quotidian basis by the Wauja, as well as to a series of ritual artefacts (flutes, clarinets, log drums) and to monstrous beings, the latter visible in special and liminal situations – the dreams of shamans and seriously sick people, trance and death – or when their masks are made for the apapaatai festivals. The figurative designs presented here are an exceptional case of widescale visualization of ‘supernatural’ alterities. Two types of transformation struck the yerupoho, which correspond to the two categories of apapaatai. Those that managed to make and wear their clothing in time became ‘clothing,’ which correspond to the invisible and visible extra-human beings. The visible beings are animals properly speaking, while the invisible beings are their ‘supernatural duplicates,’ which possess a monstrous nature absent from the visible beings. The yerupoho who remained ‘naked’ were affected in a definitive and drastic manner with the appearance of the sun: they turned into apapaatai iyajo (true apapaatai, that is, those that do not use ‘clothes’), extremely dangerous beings who devour or simply kill weaker beings, including humans. 3. kumã beings – a category better translated as monsters, which are subdivided into three other categories: yerupoho, apapaatai iyajo and apapaatai ona~i, or simply apapaatai. The terms mona and kumã act as linguistic modifiers of the nature of the world’s things and beings, ordering them in a continuous and flexible scale of subthings and superthings. This classificatory model has been described in a very similar way by Viveiros de Castro (1977) among the Yawalapiti, another Aruakan group of the Upper Xingu. The category kumã (kumalu, female) – which signifies archetype, extraordinary, monstrous, gigantic, dangerous, powerful, and/or invisible – is applied to the apapaatai and the yerupoho, but in certain contexts large predatory animas may also be perceived to have a kumã nature. In addition to a monstrous dimension, most of the truly kumã beings possess a visible and weakened dimension, represented by mona beings and things, a term which, in this specific case, signifies visible, ordinary and common, corresponding to palpable artefacts, plants and animals. These are identified by the Wauja according to their fixed habitats and predictable alimentary behaviour. In broad terms, this is a system in which each thing or being possesses a co-extensive ‘double’ of a monstrous nature. Such monsters are endowed with extreme intelligence, their own points of view and a special artistic sensibility, revealing themselves to be dangerous, malicious and creative. Most of them are sorcerers and, some at least, anthropophagic. The yerupoho, due to their impressive ‘animal-people’ or ‘artefact-people’ ambiguity and their transformative possibilities, comprise the most complex of these categories of beings. Since the yerupoho present both natures, ~iyãu and kumã (there are also a number of them known as ~iyãu kumã and ~iyãu kumalu, or man-monster and woman-monster respectively), the Wauja perceive them simultaneously as ‘people’ and monsters. The versatility in the fabrication of these beings is immense: they can be created in their thousands and each one of them can present different graphic motifs and anatomic forms. Among the most important raw materials of a ‘clothing’ are the ‘geometric’ graphic motifs and the colours which singularize it, just like a textile pattern designed to order by a stylist. For the Wauja, many ‘clothes’ have qualities of formal perfection that make them objects of especial aesthetic and ritual interest. Birds followed by snakes are taken as the most beautiful creations in this sense. In addition, though ‘clothing’ some yerupoho can change, depending on their intentions, from fish to bird, or from insect to reptile, or from mammal to amphibian, or from fox to snake, and so on, indicating an apparently endless flux of transformations in the Wauja cosmos. In Wauja ontology, relations between the extra-human beings take the form of a triad, which links the yerupoho (the anthropomorphic being that transforms into apapaatai), the apapaatai itself (the ‘clothing’ worn by the yerupoho in the transformation) and the animal, plant, natural phenomenon or artefact (which confers or inspires the corporeal form of the apapaatai). However, this is a relation that exists only between a given ‘species’ and its ‘supernatural owners,’ and not an indistinct relation involving all or any ‘species.’ There exists a triad, for example, between the peccary-animal (a mona being, figure 3), the peccary-monster (apapaatai ona~i and iyajo, kumã beings) and the peccary-person (yerupoho, an anthropomorphic being): the latter two being ‘owners’ of the peccary (animal). It is important to make clear that the three beings (mona, kumã and yerupoho) mentioned are perceived as co-extensive as they share the same soul (paapitsi). This ontological co-extension can be denominated a ‘soul coalition principle,’ which implies that the dangerous nature of ‘supernatural’ beings is also implied and potentially present in the ordinary and visible dimension (mona) of beings. This principle complements the idea of transformation with which it is directly associated, indicating the virtual boundary between mona and kumã beings and their ontological ambiguity/continuity. The differences between animals and monsters are thus much more a question of degree than nature. For the Wauja, the offensive power of mona beings is only manifested through their invisible (or more rarely, visible) dimensions, constituted by the apapaatai and yerupoho. These beings are taken to be the main agents of sicknesses, whose objectification occurs through the insertion of ensorcelled objects and/or the ‘theft’ of the human soul. The Wauja recognize three classes of shamans: yakapá, pukaiwekeho and yatamá. The yakapá are the shamans with the greatest therapeutic power and ritual prestige due to their speciality of rescuing the souls taken by the apapaatai and yerupoho, reversing the situations of highest risk to life for sick people. Yakapá literally means “one who runs semiconsciously” in order to rescue souls. His ability is intimately connected to his vision (divination/identification) of sicknesses and their human and/or extra-human agents, and the friendly relations he maintains with his apapaatai helpers. A yakapá shamanic session in Piyulaga is an event which attracts the attention not only of the sick person’s family but also curious children and adults from other residential units. By watching the divinatory performance and the extraction of ensorcelled objects and listening to the yakapá’s replies concerning the cause and agents of the sickness, normal individuals (non-yakapá) learn about the basic foundations of the group’s cosmology and/or have these revalidated. 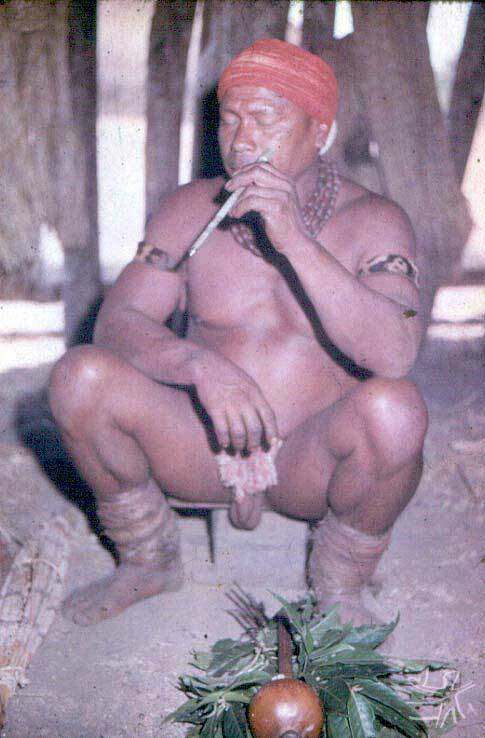 This is one of the main positions occupied by shamanism in Xinguano sociality. Another important class of shaman is the pukaiwekeho, the master – or owner – of shamanic songs. Among the Wauja, there are seven pukaiwekeho, one of whom is famous throughout the Upper Xingu. Among these seven, two are also yakapá, which amounts to a double accumulation of prestige. Possessing both abilities is something extremely costly: the apprenticeship of the songs, which are said to be ‘secret,’ requires expensive payments and a long period of dedication. Apprenticeship of specialized knowledge – which will enable a person to benefit from an enhanced social status – requires that the student repays his teacher with luxury items, or less frequently with his labour. The third class consists of shamans called yatamá, those who “only smoke,” referring to the curing potential contained in tobacco smoke. Yatamá is also the generic name for shaman and the first level in a long scale of apprenticeship which culminates in the complete mastery of the techniques of trance, soul rescuing, divination and knowledge of the full repertoire of curing songs. Therefore, the yakapá and pukaiwekeho are also skilled in the techniques of yatamaki, ‘tobacco shamanism.’ In Wauja society, yatamaki knowledge is not directed exclusively to men. In fact, a yatamalu, a female shaman, was active until the middle of the previous decade. She probably began her curing profession soon after a large measles epidemic in the 1950s. However, the initiation of women into shamanism is limited, since they do not attain the highest level of yapaká, at least according to the historical reports spanning the last 150 years. The frequency of sicknesses in Piyulaga is relatively high if we take into account the small population (270 individuals), and the significant number of shamans in constant activity: fifteen in all – six yatamá, seven pukaiwekeho and four yakapá (two of which are also pukaiwekeho). Even the least serious illnesses – such as the dermatoses which afflict the Wauja in high numbers – usually require the attention of a shaman so as to extract the ensorcelled objects. Sickness is a path opening out onto the complex of relations between the Wauja and the apapaatai and yerupoho. For the yakapá in particular, it is their courage and resistance in overcoming a serious illness that enables them to receive the apapaatai who made them sick and provoked their accentuated powers of vision and hearing. In other words, such powers are partly derived from the decision to leave in place the malignant objects introduced into their bodies by the apapaatai. The yakapá therefore have the apapaatai inside themselves in a permanent co-existence, which makes the yakapá ‘eternally sick.’ Serious illness enables an experience of power; while for some this is fleeting, for others the experience becomes atemporal, allowing them to journey through different spaces and times from those lived day-to-day. In so doing, the apapaatai, who previously could have killed the sick person, become their allies instead, ~iyakanãu (‘helper apapaatai’), transforming the person into a yakapá, protecting him (or her) and supplying therapeutic and visionary-divinatory powers. 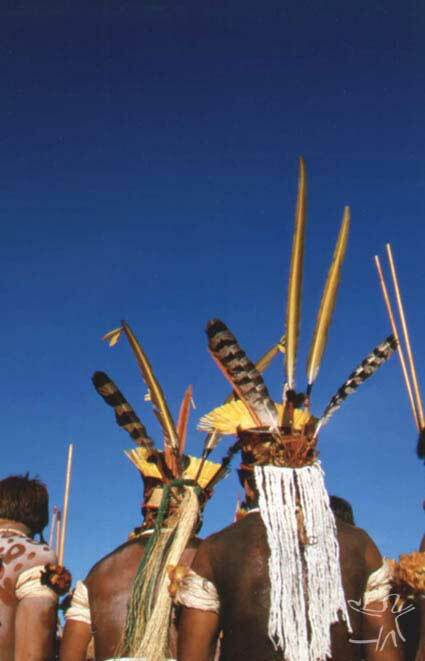 Most of the shamans’ actions have the aim of reversing states of sickness that, according to the Wauja, are manifested according to the following circumstances: 1) the production of harmful spells by human sorcerers (~iyãu opotalá); 2) the introjection of malignant objects into the body of a sick person by apapaatai and yerupoho; 3) the abduction of souls by the latter two classes of beings; 4) contamination by the epidemics of Whites. The last two ways of becoming sick are associated with the second, since all diseases, even the least serious, involve different qualities and quantities of pathological (ensorcelled) objects into the body of the victim. However, this rule excludes sicknesses caused exclusively by ~iyãu opotalá, as these are projected from the exterior. Today, from the sanitary point of view, epidemics are under control. For the Wauja, the problem with serious illnesses resides in circumstances 1) and 3); however, it is extremely rare for these to occur without the simultaneous or progressive involvement of the four forms mentioned above. Re-establishment of a state of health begins with the extraction and neutralization of the introjected objects and recovery of the soul whenever this has been taken away by the apapaatai. In situations of serious illness, a session of shamanic chants (pukayekene) is held with the aim of removing enormous quantities of ensorcelled items from the sick person’s body. In addition to chants, rattles are also employed (Coelho 1988), instruments with an immense therapeutic power. According to Mello’s observations (1999:182), “the cure of a sick person is related to pleasing the Apapaatae with music.” But not just this: the pukayekene music works to extract pathological objects. In order to obtain full therapeutic efficacy in the case of very serious cases, it is imperative to organize a festival for the apapaatai who caused harm to the patient. In general, these festivals demand the fabrication of various ritual objects, which may comprise manioc bread spatulas (figure 01), masks (figure 02), flutes, clarinets, manioc diggers, pestles, baskets, pans, arrows, etc. Even after being rescued, the soul (paapitsi) remains at risk. It is only fully safe after performing the specific festival for the apapaatai who caused the illness, which results in the establishment of a new alliance between a human entity and an apapaatai. The apapaatai festivals can be compared to a type of aesthetic therapy, the cure being the restoration of beauty. The participation of the afflicted person in the festival is not necessary for the cure, neither does he or she need specific decoration or artistic attention to be cured. But the sick person must be the festival sponsor. 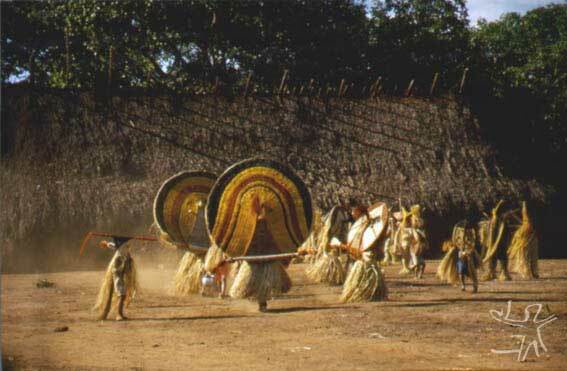 The apapaatai are said to have a particular avidness for food and entertainment, such that they repay the person they attacked and who sponsored the festival by protecting them from probable attacks from other apapaatai. In this way, the sick person emerges strengthened, not only in terms of his or her relations with the ‘supernatural,’ but above all because in becoming owner of an apapaatai festival he or she begins to participate in a network of prestations and counter-prestations of ritual services in the village. Ex-victims must subsequently offer a festival to their protector apapaatai according to a larger cycle whose periodicity can vary from some months to several years. They will therefore have to look after the flutes or masks of the apapaatai which now belong to them and which will remain in their house or in the house of flutes (kuwakuho). The flutes are preserved with extreme care, but the masks are kept until they deteriorate or until a suitable moment for burning them. Relations with extra-human alterities embedded in political and ritual structures that amalgamate the relations of reciprocity between the Wauja through the redistribution of food and ritual services (construction of houses, plantation of swiddens, processing of foods and production of artefacts for domestic use). The symbolic circuit of these structures emerges from the complex of the illness, more exactly from the abduction of the soul and its consequent rescue. The political relevance of shamanism is manifest in the flow of negative reciprocity that becomes objectified in the divination of the causes of sicknesses, in accusations of ‘sorcery,’ in the fear of these accusations and in defensive acts of a magico-symbolic nature, which configure a permanent symbolic war within and between the villages. Xinguano shamanism, as well as a powerful ‘policing oracle’ (Menezes Bastos 1995), which functions in the context of ‘sorcery accusations,’ is an instrument for the negotiation of souls and the mediation of the conflict with extra-human alterities. A sickness entering a grave state is always manifested through the abduction of the sick person’s soul by an apapaatai. The Wauja shaman’s role is to rescue the soul and re-introduce it into the patient’s body, thereby avoiding his or her death due to the definitive loss of their soul. The rescue of the patient’s soul is negotiated directly with the apapaatai who stole it, a moment in which the yakapá assumes the role of a diplomat who promises, in the sick person’s name, a festival and food to the apapaatai. Following these observations, it is possible to think of the shamans as renewers, in the first instance, of the cosmic contract that presupposes, among other things, the establishment of a relation of positive reciprocity between the different ontological realities (humans and monsters). One of the fundamental aspects of this cosmic contract is perhaps avoiding a situation where human beings become metaphysically transformed into apapaatai. It is thus in the shaman’s power to maintain each ontological reality in its place. By negotiating the return of stolen human souls, the shaman avoids the permanent dwelling of the souls in the worlds of the monsters and the threat of their ‘re-socialization’ among the latter. Extrapolating from the evidence of the relations of forced reciprocity between the Wauja and the monstrous alterities, I would also suggest that Wauja cosmic politics (cf. Viveiros de Castro 1996) operates the whole time towards the conversion of asocial domains, characterized by the manifestations of malefic power of the extra-human alterities, using devices such as art and the offering of food, objectified in the apapaatai festivals. On the other hand, the festival itself converts into an accumulation of ‘ritual prestige’ for both the sick person who sponsored it and the shaman who organized it. This prestige appears to derive from the disposition of the patient (always helped by his consanguine and/or co-resident kindred) and the shaman (always helped by his ~iyakanãu) in controlling the asocial, avoiding any imbalance between the two ontological realities. Following this reasoning, the apapaatai festivals amount to the final and supreme moment of overcoming a liminal situation (the illness) in which a Wauja (human) entity was close to transforming metaphysically into another (monster). In this sense, the apapaatai festivals point to the symbolic play of re-elaboration/reproduction of identity and alterity among the Wauja, events characterized as eminently artistic experiences. This relation of reciprocity maintained between the sick person and the apapaatai demonstrates that they are not simply ferocious monsters or the enemies of humans. They are indeed enemies, although potentially friendly. Among the Wauja, at least, the reversal of the allied apapaatai’s aggression depends on the skills of the shamans in negotiating the rescue of the stolen soul and offering them festivals (meaning food, joyfulness and beauty). The reversal of the attitudes of fear and respect which the Wauja normally have for the apapaatai into attitudes of friendship and intimacy is a political matter, a type of shamanic diplomacy with the extra-human alterities. The bibliography available on the Wauja is relatively small. It comprises three academic theses and a set of small articles covering primarily mythology (Schultz 1965; Schultz & Chiara 1971; Coelho 1980 and 1986; Ireland 1988; Mello 1999, the latter also features an emphasis on music), language (Richards 1973, 1977 and 1988), material culture and visual arts (Lima 1950; Myazaki 1978 and 1981; Coelho 1981, 1988, 1991, 1991-92b, 1993 and 1995; Barcelos Neto 1999, 2000, 2001a, 2001b and 2001c), ritual (Myazaki 1966; Schultz & Chiara 1976 and 1980 and Coelho 1983 and 1991-92a) and politics (Ireland 1991 and 1993). The author thanks FAPESP for the support granted towards field research and analysis of the material. BARCELOS NETO, Aristóteles. Apontamentos pra uma iconografia histórica xinguana. In: FRANCHETTO, Bruna; HECKENBERGER, Michael (Orgs.). Os povos do Alto Xingu. Rio de Janeiro : UFRJ, 2001. p. 193-218. --------. Monstros amazônicos : imagens Waurá da (sobre)natureza. Ciência Hoje, Rio de Janeiro : SBPC, v. 27, n. 162, p. 48-53, jul. 2000. --------. Panelas que cantam e que devoram : a cerâmica Wauja. In: BRITO, Joaquim Pais de (Org.). Os índios, nós. Lisboa : Museu Nacional de Etnologia, 2000. p. 136-53. COELHO, Vera Penteado. Alguns aspectos da cerâmica dos índios Waurá. In: HARTMANN, Tekla; COELHO, Vera Penteado (Orgs.). Contribuições a antropologia em homenagem ao professor Egon Schaden. São Paulo : Museu Paulista, 1981. p. 55-84. --------. Die Waurá : Mythen und Zeichnungen eines brasilianischen Indianerstammes. Leipzig : G. Kiepenheuer, 1986. 139 p.
--------. Um eclipse do sol na aldeia Waurá. Journal de la Société des Américanistes, Paris : Société des Américanistes, v. 69, p. 149-67, 1983. --------. A festa do pequi e o zunidor entre os índios Waurá. Bulletin de la Soc. Suisse des Américanistes, Genebra : Soc. Suisse des Américanistes, n. 55/56, p. 37-56, 1991/1992. --------. Figuras antropomorfas nos desenhos dos índios Waurá. Bulletin de la Soc. Suisse des Américanistes, Genebra : Soc. Suisse des Américanistes, n. 55/56, p. 57-77, 1991/1992. --------. Figuras zoomorfas na arte Waurá : anotações para o estudo de uma estética indígena. Rev. do Museu de Arqueol. e Etnol., São Paulo : USP-MAE, n. 5, p. 267-81, 1995. --------. Histórias xinguanas. Publicações do Museu Municipal de Paulínea, Paulínea, n. 11, 1980. --------. Histórias Waura. Publicações do Museu Municipal de Paulínia, Paulínia, n. 27, p.7-18, 1984. --------. Informações sobre um instrumento musical dos índios Waurá. Rev. do Museu Paulista, São Paulo : Museu Paulista, v. 33, p. 193-224, 1988. --------. Motivos geométricos na arte Uaurá. In: COELHO, Vera Penteado (Org.). Karl von den Steinen : um século de antropologia no Xingu. São Paulo : Edusp/Fapesp, 1993. p. 591-629. --------. Waurá : a selection of drawnings by the Waurá indians of the Alto-Xingu, Mato Grosso, Brazil.. Sonoma State University, 1991. (Exhibition Catalogue). FARIAS, Agenor José T. P. Waurá : índios da região do Alto Xingu. Museu Universitário PUCCamp, Campinas : PUC-Campinas, n. 4, p.3-12, s.d. IRELAND, Emilienne M. Cerebral savage : the white man as symbol of Cleverness and savagery in Waurá myth. In: HILL, Jonathan (Org.). Rethinking history and myth. Chicago : Univ. of Illinois Press, 1988. p.157-73. --------. Neither warriors nor victims, the Wauja peacefully organize to defend their land. Cultural Survival Quarterly, Cambridge : Cultural Survival, v. 15, n. 1, p. 54-60, 1991. --------. Noções Waurá de humanidade e identidade cultural. In: FRANCHETTO, Bruna; HECKENBERGER, Michael (Orgs.). Os povos do Alto Xingu. Rio de Janeiro : UFRJ, 2001. p.249-86. --------. When a chief speaks through his silence. PoLAR, Washington : American Anthropological Association, v. 16, n. 2, p. 19-28, 1993. LIMA, Pedro E. Os índios Waurá. Observações gerais : a cerâmica. Boletim do Museu Nacional: Série Antropologia, Rio de Janeiro : Museu Nacional, n.9, 1950. MENEZES, Maria Lúcia Pires. Parque do Xingu : uma história territorial. In: FRANCHETTO, Bruna; HECKENBERGER, Michael (Orgs.). Os povos do Alto Xingu. Rio de Janeiro : UFRJ, 2001. p. 219-46. SCHULTZ, Harald. Lendas Waurá. Rev. do Museu Paulista, São Paulo : Museu Paulista, v.4, p.21-149, 1965. --------. 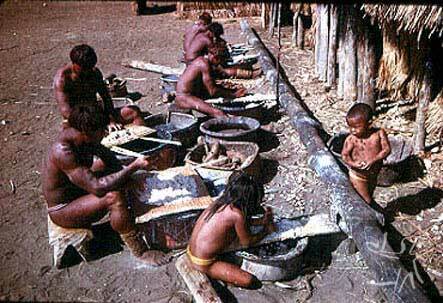 The Waurá : brazilian indians of the hidden Xingu. National Geographic, s.l. : s.ed., n.129, p.150-52, 1966. --------; CHIARA, Vilma. Informações etnográficas dos índios Waurá. In: INTERNATIONALES AMERIKANISTENKONGRESSES (38o.). Verhandlungen. v.3. Stuttgart : s.ed., 1968. p.286-308. --------. Mais lendas Waurá. Journal de la Société des Américanistes, Paris : Société des Américanistes, v.60, 1971. --------. Notes sur quelques categories religieuses des indiens Waurá du haut fleuve Xingu (Brésil). Rev. do Museu Paulista, São Paulo : Museu Paulista, v. 27, p. 373-400, 1980. --------. A pá semi-lunar da mulher Waurá. Rev. do Museu Paulista, São Paulo : Museu Paulista, v.17, p.37-47, 1976. WAURÁ : Ação Declaratória visando o reconhecimento de parte das terras tradicionais excluídas dos limites oficiais do Parque do Xingu. In: ARAÚJO LEITÃO, Ana Valéria Nascimento (Org.). A defesa dos direitos indígenas no judiciário : ações propostas pelo Núcleo de Direitos Indígenas. São Paulo : Instituto Socioambiental, 1995. p. 259-84. WAURÁ : a selection of drawings by the Waura indians of the Alto-Xingu Mato Grosso, Brazil. Rohnert Park : Sonoma State University/University Art Gallery, 1991. 31 p.